It is a known fact for car owners that a car's well-polished paint can add to its market and overall value. Aside from that, car colours can be associated with the personality and lifestyle of its owner. For these reasons, painting or repainting a car should be done perfectly without a trace of error. As the owner, you may not be doing the painting job yourself, but it is great to have an idea as to how your priced possession can be prepared for a painting process. Whether you plan to have a do-it-yourself job or hire a professional painter, see to it that each crucial step should be followed so as to achieve a well-polished and high-end look. This is where a good bird's eye view of the process comes in. Read on to have an idea. Take time in doing this because taking shortcuts in this primary step can have a great effect on its final outcome. Always remember that having enough time for surface preparation will be reflected on its overall impact. 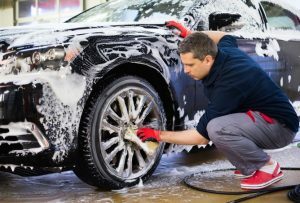 To give you an idea, a car's surface should be washed thoroughly with soap and water after which, it should be dried up and applied with wax to get rid of deeply-rooted grime. To do this perfectly, use a clean lint-free wipe when applying grease remover solutions. Make sure you apply it one panel at a time. Avoid reusing soiled wipes on other surfaces as this will only lead you to repeat the procedure. Car parts to be painted or repainted need to be sanded with a grey scuff pad, the kind that you can purchase in hardware stores. 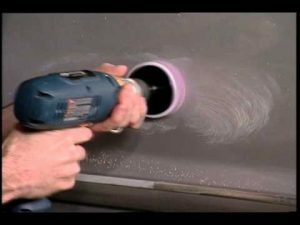 This can also be done more efficiently by using a scuff paste. After this, the area should be washed again with soap and water. Dry it up before applying an adhesion promoter. Metal parts must be coated with a rust inhibiting substance and this will serve as the primer before sanding it again with a new sheet of a grey scuff pad. The purpose of this is to prevent unpaintable parts from getting painted. Use a ¾ inch masking tape for this. 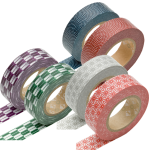 Take note: not just an ordinary tape can be used but a decent quality of automotive tape will do the trick. 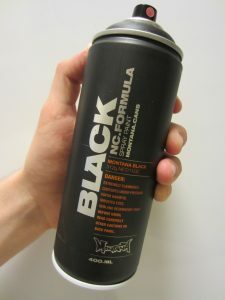 As with other spray painting jobs, shake the can before the procedure. Apply the paint in a uniform and organised pattern to avoid having a blotchy effect. The first coat should be a see-through coat and should not be heavier than the second coat. As a rule, the second coating should always be heavier than the first coat. Perfect coverage can be achieved by applying three to four coats. As a rule of thumb, wait for a few hours before applying the next coat of paint. Some professional painters even suggest waiting for a day. This is to avoid flooding of colours on a certain part. After achieving the perfect colour, apply coats of a clearing material. As mentioned before, this is not always a do-it-yourself paint job. You can always ask the help of experts in car spray painting in Melbourne to get the best results.